[Deg]: The Grand Goof, owner and overseer of all Goofy Pages. She makes sure things are updated, workers are working correctly, and that everything gets done. 2005-11-29 [Tear]: Will do, lol. 2005-12-18 [dude? ]: how do you be come a goof? 2005-12-18 [Tear]: Take a picture of yourself while you on are on the elfpack website, and then submit it to us, and it will eventually be put up on the mainstuff page. 2006-08-31 [FireGypsy]: It seems that the Cool Shades entries arent getting posted. 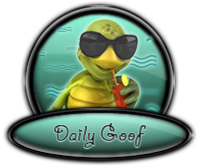 I was wondering if you could put them up at the same time as the daily goof. Since the daily goof is up for more than 3 days anyway. I figured it would work out better. 2006-08-31 [Tear]: I forgot all about the Coolshades, lol. I'll grab one from there with the next switch. 2006-08-31 [FireGypsy]: Nice ^-^ Just making sure they arent forgotten lol! Thanks a bunch! 2007-06-19 [Hedda]: We're updating the crew a little as the Daily Goof hasn't been changed for a while (except when I did it). [Tear], you'll get [nevan] and [Nevermore.] messing around on the page. 2007-06-21 [Tear]: It works for me we need new crew people anyway, this place hasn't gotten as active as it was, mainly because of the goof changes. 2007-07-02 [Hedda]: Well, we have 7 (correct) goofs on GEE! - The Submissions and it's time to replace [skullhead], I think. He's been there for over 2 weeks. 2007-07-15 [Hedda]: Now it's time again! 2007-07-17 [Nevermore. ]: i know, damn thing, i only get an hr at the libaryy atm, but i get it back tonight yay! 2007-09-29 [nevan]: Is it ok if I post a new goof on mainstuff? The last one has been up a while. 2007-09-30 [Tear]: go for it. 2008-09-08 [Hedda]: As [Firenze] is no longer active on Elfpack, I replaced her with [nevan] better show the current state.